About Us & What We Do At Four Ashes. We are a family owned Leading Independant Aston Martin Specialist based near Stratford-upon-Avon in the Heart of England, the Company has been owned by Jean Moss & Chris Adams since January 2003. Jean is the daughter in law of Four Ashes Founder Jack Moss & widow of Michael Moss, Jack's son who died in 1982, Chris Adams was a family friend of Jack & family before working at Four Ashes from the early 1970s, Chris is also long term partner now husband of Jean, Chris helped with vehicle repairs from an early age (6!) with his father's haulage business before working at Four Ashes & has run his own workshop in between Four Ashes stints, specialising in high performance cars including many Aston's, racing of classic cars & rallying, eventually involving Opel Manta 400's in the Republic of Ireland. 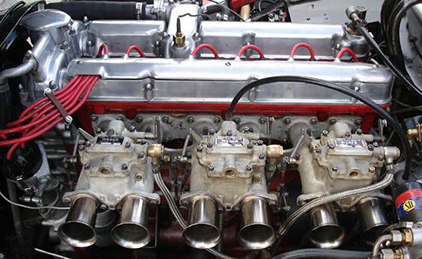 Chris rebuilt his 1st Aston cylinder head when just turned 17, by 18 he was rebuilding 40% of the Aston engines that came through Four Ashes hands, including all of the race engines for MYT 625, the Racing DB2 that the garage owned, which is now owned by Chris & Jean. Both were long standing Member's of the Aston Martin Owners Club, now Family Member's or Joint Member's, Note that periodically Jean & Chris do talks of their experiences at AMOC Area meetings. Some of Jean's interests are; Aston Martin's, Classic Cars, Historic Motor Racing, Photography, Wildlife, family inc grandchildren. Some of Chris's interests are; Aston Martin's, Classic Cars inc Classic racing cars, Historic Motor Racing, Gliding at Stratford Gliding Club, Dragon boat racing from Sept 2012, road cycling, anything technical & mechanical to do with cars & engines, family inc grandchildren. What Do Four Ashes Do? We have been servicing, rebuilding, restoring & racing Aston Martin cars for well over 40 years, Chris has over 43 years experience with the marque. 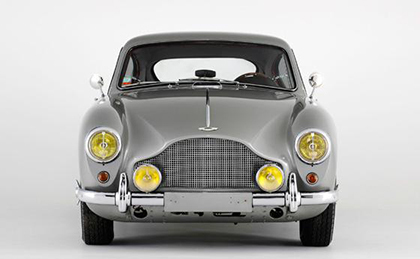 We also offer Aston Martin parts & an extensive range of our own parts. Besides the full range of normal mechanical services you would expect we have an in-house first rate body / panel specialist and use a local first rate paintwork specialist, all dedicated to giving you the best possible workmanship. We are proud of the fact that we are one of the few Aston Martin specialists that can carry out more than 70% of any rebuild in house. Our Remanufactured Parts are being added all of the time, so keep an eye on our Part News page regularly. We put descriptions on the page of new parts as they become available and also information on parts we will be selling in the near future. The Parts side bars shows pictures and descriptions of our standard range of parts. Our specialist knowledge is for vehicles ranging from the DB2 through to the DB7 with the emphasis on DB2 to AM V8 1988. If your interest is in Prewar cars can we suggest that you contact Ecurie Bertelli. For more info on Four Ashes see Four Ashes® History, its a big page ! Shortly to be a book, hopefully very amusing!